Citizen Journalism for Lake Minnetonka. Despite being one of the busiest lakes in all Minnesota, Lake Minnetonka survived the 2009 boating season without a zebra mussel sighting. It will be interesting to see if they are any larve in the lake with a first sighting in the spring--that's how it happened in Prior Lake this year. Keep your fingers crossed. I spent several hours cleaning the hull of my boat this afternoon, and don't know what I would have done if it had been caked with zebra mussels. Clap and cheer as you watch the Finale of the Lake Minnetonka fireworks! The weather was perfect Thursday evening for members of the Wayzata Yacht Club to compete in a sailboat race on Lake Minnetonka. 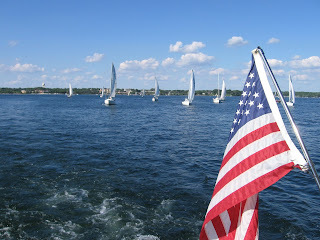 Dan from LakeMinnetonka.MN captured this photo of the race while enjoying the Young Professionals Boat Cruise. For more information about the Wayzata Yacht Club and upcoming sailboat races, visit their Web site. RP had received a FedEx package and had put it on the roof of her vehicle, then accidentally drove off with it still on the roof. Now they are unable to locate it and believe it might have been taken. Value of loss $1,000. RP was getting gas and put his wallet down on the topper, then forgot and drove away. He was contacted by a female who found and returned the wallet, but several cards were missing from inside. Theft of golf clubs from unlocked motor vehicle while parked in parking lot. RP did not have information on make, model, and value of clubs at time of report. Complaint of 5 juveniles in the area picking flowers from two yards. RP advised one of suspects pulled a flower from her yard from the roots. No dollar damage amount. RP went to leave this morning and noticed her garage door was open and that both cars inside had been gone through, but didn’t notice anything missing. Now realized golf clubs were missing from garage. Value of loss $1,200. Victim accidentally left garage door open overnight. Could tell someone had entered and gone through several boxes inside. Only thing apparently missing was old laptop valued at $100. Victim found golf clubs missing from garage and iPod missing from inside vehicle. No signs of forced entry and unknown how entry made. Value of loss $1,200. RP reported graffiti on the bridge that goes over the train tracks. RP said the graffiti can be seen from the walking path and is just some black symbols. RP stated it has been there for quite some time. RP’s vehicle had eggs thrown at it in the vicinity of Co Rd 101/26th Ave. RP was unsure whether there was any permanent damage to vehicle and was advised to wash it as soon as possible. Victim had been gone for a week with his parents staying at his home watching his children. Golf clubs are missing from garage and overhead door may have accidentally been left open. Value of loss $1,000. Report that unlocked vehicle entered and gone through while parked in driveway overnight. Nothing apparently missing or damaged at time of report. Victim accidentally left overhead garage door open. Vehicles inside had been gone through, but nothing apparently missing. Victim came home and saw two young males standing by her garage and when they saw her they fled. The two 12-year old males were identified and admitting forcing open the window and taking fishing rods from garage. Both boys being sent to diversion. RP’s vehicle was stolen from the secured garage of the apartment building sometime overnight. All of his property was removed and placed in a black garbage bag, which was left in the stall. Turned out to be repo – unfounded. Victim never received his Social Security check and believes it may have been stolen from his mailbox. The victim received an email offering him a job as a purchasing agent. He had never applied for the job. The job was to purchase electronic equipment for the company’s European offices. The suspect was instructed to purchase items using his own credit card and then ship them. They were making money transfers into his account to cover the costs. Today he found out the company had frozen the account because of fraudulent activities stating the transfers were all no good and that money had been removed. Victim had already purchased and shipped two digital cameras and two GPS units. Value of loss $5,008. The victim reported the theft of his golf clubs from unlocked vehicle that was parked in the driveway over the weekend. There was no damage to the vehicle. Value of loss $800. Witness reported playground equipment was burning when she and her children arrived at park approximately 5 minutes earlier. Plastic tube slide had hole burned in it. Victim came home and found couch, chair, TV, vacuum, and cash missing from apartment. No evidence of forced entry. Victim believes suspect, who stayed with her for a while, may have had a duplicate key made without permission. Value of loss $1,950. Victim’s son had friends over on Friday evening. On Saturday, they noticed two iPods missing from home. Value $700. Rear window of vehicle shattered. Lawn care company for the complex was out mowing earlier and may have thrown an object from the mower. No items found in or around the damaged vehicle. The victim was selling furniture on Craig's List. A party wanted to buy the item and sent a check for $2,000 over the asking price requesting that the victim send the additional $2,000 to the mover that would pick it up. The victim called on the check and found it was a forgery. Boat was taken while parked in lot overnight. Value of loss $3,500. Mailbox damaged overnight. Value of loss not listed on report. Sometime past 0530 today unknown suspect hit victim's mailbox with bat. They hit is so hard that it broke post. Total damage was about $100. Unlocked vehicle parked in the driveway had two pair of sunglasses and sports equipment taken out or it. Total value of loss $307. RP reporting damage to mailbox overnight. Value of damage $100. RP reporting damage to mailbox overnight. Value of damage not listed. Sometime during the night the victim’s mailbox was smashed with a bat. The wooden box was completely destroyed. The value of the box is $100. Unknown suspect damaged Victim’s mailbox with a bat. Value of damage $25. RP reporting damage to mailbox overnight. Value of damage $50. The workshop will be held on Thursday, July 16, 7 p.m. at the Plymouth Creek Center, Black Box Theater, 14800 34th Avenue North. The workshop is designed to give parents a better understanding of social networking sites and teenagers use of them. These sites provide great opportunities for young people to meet and share experiences, but with this freedom come a degree of risk and the need to act responsibly. Whenever kids go online, so do those who seek to abuse them. The workshop will be taught by Officer Mike Passig. Passig began his law enforcement career in 1997. Since then, he has worked in a variety of capacities such as patrol operations, SWAT, Recreational Enforcement (boat and water patrol), and rescue diving. After working numerous years as a School Resource Officer for the Wayzata School District, Passig is now assigned to Plymouth’s Patrol Division. Officer Passig is well versed in Internet safety and is a certified trainer. He has used his experience to identify the online issues that families deal with and has worked with parents and students on the risks associated with the internet. Registration for “MySpace, Whose Space?” is being taken by phone at 763-509-5198 and through the Police Department’s residential E-mail Alert Network at scwayna@ci.plymouth.mn.us. There is no fee for the workshop, but parents will be encouraged to purchase a $15 AMBER Stick (www.amberstick.com) at the end of the workshop. Space is limited. This is absolutely one of my favorite videos on Youtube! These young girls lip-synch to the KS95 Lake Minnetonka Song. "South Lake Minnetonka Blog" to become "LakeMinnetonka.MN"
Hello South Lake Minnetonka Blog readers! Thanks so much for stopping by. If you didn't know, this blog is now under new management, as South Lake Blogger has turned it over to the crazy people who run Wayzata.com. Rest assured that South will still be contributing to it from time to time, but he felt it was better to turn it over to someone who was more passionate about keeping this collection of info fresh. You can expect to see some big things coming in the future, as we roll out a number of improvements in the coming months. The biggest of these is that we will be changing the name of this blog to LakeMinnetonka.MN from the South Lake Minnetonka Blog. We have some technical kinks to work out, so please stay tuned. That being said my team and I look forward to working with the Lake Minnetonka community in a collaborative way. If you have any comments or suggestions, please don't hesititate to contact me personally at 952-473-5800. Thanks to mur25ry for putting together this YouTube video that shows DL surfing on Lake Minnetonka behind a boat! Check out the swimming portion of the Lake Minnetonka Triathalon that was held yesterday! Today's Lake Minnetonka Triathlon couldn't have occurred on a better day. Racers were greeted by blue skies, comfortable temps, and a slight breeze. Congratulations to winner Brett Lovaas as well as the 450+ other participants. We've written before, but we'll say again, that these active events bring a great crowd to Excelsior. Whether it is the 4th of July run, this triathlon, the Wells Fargo half marathon, or others, we welcome racers with open arms and open they make these races a regular destination on their summer circuit. The Lake Minnetonka Triathlon will kick off at 7:30am on Saturday morning. For those who haven't spectated before, it can be alot of fun to see polished athletes compete as well as first-timers complete their first triathlon. The best place to watch is from the Excelsior Commons, as that is where the swim starts, ends, and all of the transitions take place. Final finishers will start crossing the finish line anytime after 8:45am, but there will be steady action to watch anytime from 7:30 to 10am or so. The South Lake Minnetonka Blog is becoming a part of the Wayzata.com network beginning next week. Wayzata.com, operated by Dan Gustafson, has been online for several years and has a great track record of keeping fresh, current, local content on the site. Dan will take over primary authorship of the blog, but the current contributor(s) to the South Lake Minnetonka Blog will continue to post occasional columns. The transition has two primary purposes: First, to ensure that a more full-time focus can be given to the blog resulting in more frequent and relevant posts, and second to help create a larger network of information as the Lake Minnetonka area is really one large community. We have full confidence in Wayzata.com to take this blog and the entire network to the next level. Thank you for your readership thus far. Excelsior's annual Art-on-the-Lake, the premier Lake Minnetonka Art Fair, is next Saturday and Sunday, June 13 and 14. The official link, including participating artists and a schedule of events, and be found here. According to a list found at the Huffington Post and a story in the Star Tribue, Mason Motor Company of Water Street in Excelsior is on "the list" for dealer terminations. Keep in mind that Jeep is an owned brand of Chrysler as well.